Can be played without Steam running, but still requires its steam_api.dll file to launch. Steam-related extra content and DLCs cannot be accessed without a Steam log-in. Steam version features updated high-resolution visuals, widescreen support, Steam-exclusive content, and a lobby system for online multiplayer through Steamworks. Steam and DRM-free versions are not compatible with each other in multiplayer. Adds 11 new cards (3 common, 4 uncommon, and 4 rare) to the game for players to use in their own deck. Adds 12 new cards (4 common, 4 uncommon, and 4 rare) to the game for players to use in their own deck. 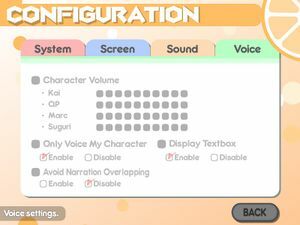 Enables in-game voice options, and adds voice-overs for Suguri, QP, Marc, and Kai. Adds voice-overs for Marie Poppo, Yuki, Hime, and Fernet. 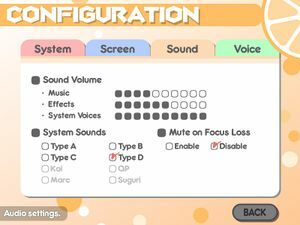 Adds voice-overs for Aru, Sora, Peat, and Tomomo. Adds Syura (QP Shooting - DANGEROUS!!) and Nanaka (SUGURI) as playable characters along with various new extras. Adds Saki (SUGURI) and Kyousuke (QP Shooting - DANGEROUS!!) as playable characters along with various new extras. Adds Krila (QP Shooting - DANGEROUS!!) and Kae (SUGURI) as playable characters along with various new extras. Adds Alte (Sora) and Kyoko (SUGURI) as playable characters along with various new extras. Adds Sham (Sora) and Sherry (Flying Red Barrel) as playable characters along with various new extras. Adds Star Breaker (Sora) and Sweet Breaker (QP Shooting - DANGEROUS!!) as playable characters along with various new extras. Adds Nath (Sora) and Tomato & Mimyuu (QP Shooting) as playable characters along with various new extras. Adds Kiriko (QP Shooting - DANGEROUS!!) 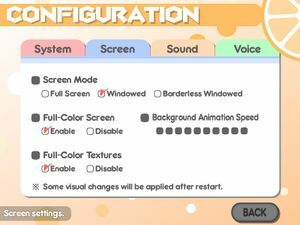 and NaName (Acceleration of SUGURI) as playable characters along with various new extras. Adds an alternative Winter costume for Suguri and Hime. Adds Miusaki and Ceoreparque (Alicianrone) as playable characters along with various new extras. Adds Dangerous Yuki (QP Shooting - DANGEROUS!!) and Causal & Sweet Eater Tomomo as playable characters along with various new extras. Adds Tsih (Sora) and Captain Tequila (Flying Red Barrel) as playable characters along with various new extras. Adds Arthur and Nico (QP Shooting - DANGEROUS!!) as playable characters along with various new extras. Adds an alternative version of Aru. Available to Steam owners of Xmas Shooting - Scramble!!. Adds an alternative version of Marie Poppo. 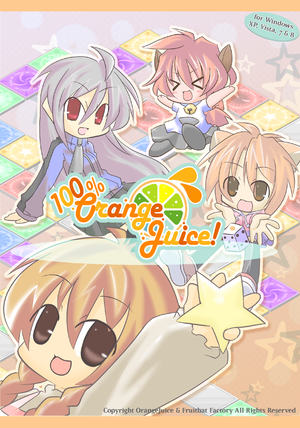 Available to Steam owners of 200% Mixed Juice!. Adds an alternative version of QP. Available to Steam owners of QP Shooting - Dangerous!!. Adds an alternative version of Sora. Available to Steam owners of Sora. Adds an alternative version of Suguri. Available to Steam owners of Acceleration of SUGURI 2. Download the latest patch here for the overseas version or here for the original Japanese version. The Steam version is already updated with the latest patches. Supported in the Steam version. 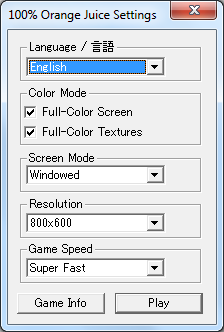 Enter resolution manually, game is stretched. Game speed is tied to frame rate. Cap the frame rate at 60 FPS. Voice settings. Can only be changed if voice pack DLC is installed. 4 Not available in Steam version. Not available in Steam version. The game's IRC channel (webchat) is a source of live support. This game won't run on an environment that cannot run DirectX, but in some cases you can get it to work. 8.1, 9.0c DirectX 8.1 is used in the Japanese version, wheres the overseas version uses 9.0c. Steamworks Used in the overseas Steam re-release. ↑ 2.0 2.1 File/folder structure within this directory reflects the path(s) listed for Windows and/or Steam game data (use Wine regedit to access Windows registry paths). Games with Steam Cloud support may store data in ~/.steam/steam/userdata/<user-id>/282800/ in addition to or instead of this directory. The app ID (282800) may differ in some cases. Treat backslashes as forward slashes. See the glossary page for details.